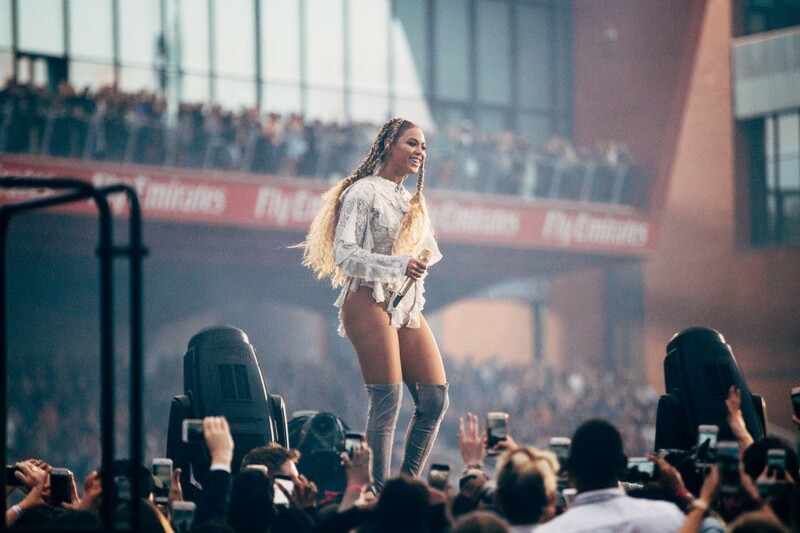 Beyonce brought her Formation world tour to Manchester’s Old Trafford, Getintothis’ Paul Fitzgerald reflects on a night of big ambition and even bigger stage sets. The tribe began assembling at 10am. They came in search of their Queen, big hair and even bigger heels, in search of empowerment and affirmation. All the single ladies, all the single ladies, and a healthy smattering of the single boys. As Old Trafford Cricket Ground filled up with expectant worshippers, and the daylight drained from the Manchester sky, excitement levels bordered on religious fervour, They wanted this. And they wanted it big. Really big. This was a meticulously delivered show of strength of scale defying proportion, from light show to sound, costume change to costume change, mammoth hit to mammoth it, there was no let up in the sheer bigness of it all. The Formation tour is an incredible beast, relentless and breathtaking, original and slick, stylish and stunning at every turn. And of course, we could not have expected anything less. From the beginning, with the opener Formation, all huge tribal headbanging choreography, it was attitude, assured and the very definition of accomplished. The crowd soaked up every note, every assured look from their leader and screamed for more. It had been over three years since her last appearance in Manchester, and they made the most of every minute. Given the price of some of the tickets, with stageside access coming in at a nifty £450, its understandable. It’s 18 years since Beyoncé first came to our attention, as a sixteen year old Texan girl, and each period of that career is reflected here, and in some cases reimagined. All the grandiose bombast balanced with more stripped down moments, without the band or dancers, where she just sits on the stage, hand in hand with audience members for a softer version of Me, Myself and I. Its a chance for us all to have a breather, but no less impressive as her voice, pitch perfect and soulfully poised, echoes through the night sky. Survivor, Crazy In Love, Bootylicious, bang, bang, bang….each one an absolutely huge pop gem. As big in their message as in their success. Never shy of getting involved politically, some of the newer material of the Lemonade album sees her in challenging form, angry almost, driven, determined and gritty nevertheless, and it’s much appreciated by the crowd. They have their favourites already, songs like Sorry and Hold Up, both well received here. Visually, it’s an absolute triumph. The most spectacular of spectacles, from the dance moves, the costumes, and the sheer power and might of her performance, again, it’s huge. Centred around an enormous rotating square video wall, which delivers fireworks, video, and a water pool for Freedom and Halo at the end of the show. It’s the poor riggers we feel sorry for. No fewer that 28 articulated trucks on this tour. There’s a ten man crew and three more trucks just for the merchandise. Unprecedented attention to detail everywhere. There aren’t many who can touch Beyoncé for putting on a show, she knows that, and so does this adoring crowd. That 16 year old girl must have dreamt of moments like this when she was growing up in Texas. Let’s hope she dreamt of being untouchable when it comes to bringing it like she did here. Because that’s the word we were left with. Untouchable. And BIG. Really, really big.